FINAL touches are being put to Gulf Industry Fair (GIF) 2014 before it gets under way this month (February 4 to 6) at the Bahrain International Exhibition and Convention Centre (BIECC). His Royal Highness the Prime Minister, Prince Khalifa bin Salman Al Khalifa, will open the fair, organised by Hilal Conferences and Exhibitions (HCE). GIF 2014, the biggest ever edition in its seven-year history, is a much-anticipated, flagship B2B exhibition for the Northern Gulf’s industrial sector. Total occupied floor space is 3,381.5 sq m this year, compared with 3,200 sq m in 2013. A total of nearly 120 exhibitors will attend, from large industrial and economic powerhouses to the vibrant downstream ecosystem of product and service providers representing the aluminium, steel and alloys, industrial processes and manufacturing, energy and environmental protection, ports, logistics and free trade zones, training for industry, industrial safety and security and marine and deep sea services segments. It promises to be the ultimate showcase of the latest products and services that currently exist in the market or entering it. About 42 per cent who took part in the 2013 edition are returning to participate alongside new local, regional and international exhibitors against a backdrop of billions of dollars of game changing industrial investments in Bahrain, Kuwait, Qatar and Saudi Arabia. Reflecting the growing regional industrial diversity, a series of sector-specific zones will bring together large organisations, purchasers and suppliers in close proximity at GIF, in a captive networking environment where strong lead generation is the minimum expectation, said the organiser. The show will feature zones for aluminium (supported by Aluminium Bahrain - Alba), ports and maritime (supported by Arab Shipbuilding and Repair Yard – Asry), industrial facilities (supported by First Bahrain-Majaal Warehouse Company), industrial processes (supported by Bahrain’s Ahmed Mansour Al Ali) and an energy zone (supported by Bahrain Petroleum Company - Bapco). Led by Alba, one of the world’s leading aluminium smelters, and endorsed by the Gulf Aluminium Council (GAC), the aluminium zone promises to reflect the sector’s positive global demand outlook, which continues to drive opportunity for downstream suppliers such as Bahraini companies ITSS, Garmco, Balexco, Midal Cables, Amiri Industries and Turk Mechanical, who will all demonstrate their capabilities at the show. “GAC considers Gulf Industry Fair to be a key part of our ongoing strategy to highlight the GCC as an aluminium hub,” said Mahmood Daylami, GAC’s secretary general. “The GCC’s importance to the aluminium sector grows year on year with the expansion of smelters in the region and the resulting growth of the downstream products and services sector,” he added. Ali Najjar, ITSS executive director, said as Gulf economies further diversify away from oil and gas, the aluminium industry assumes ever greater importance. “For many years the Gulf had only two smelters – Aluminium Bahrain (Alba) and Dubai Aluminium (Dubal). Today, there are six, with other aluminium-related projects on the horizon. These present tremendous opportunities,” he explained. GIF’s other specialist zones are attracting similarly strong responses. The Energy Zone, which enjoys top-level support from Bahrain’s National Oil and Gas Authority in association with Bapco, will mix local and regional players such as Hidd Power and Tebodin with global household names such as Chevron. Amin Al Arrayed, managing director of First Bahrain-Majaal, says: “Gulf Industry Fair is where real business is done, numerous business relationships have been made and several successful deals have also been closed as a result of our participation in 2013. At the 2014 show we plan to make a significant announcement about an additional phase to the project, as well as showcasing Majaal’s credentials as a facilitator of foreign direct investment into Bahrain. Supported by the Ministry of Industry and Commerce, the Bahrain International Investment Park (BIIP) presence at GIF 2014 will showcase the facilities and support services provided by the BIIP. HCE says GIF interest extends well beyond Bahrain, the GCC’s geographical heart and renowned exhibitions hub. This year more than 14 countries – Australia, Bahrain, Belgium, China, Cyprus, Czech Republic, India, Italy, Pakistan, The Netherlands, Saudi Arabia, UAE, the UK and the USA – will be represented by their products, more than twice the number in 2013. Saudi Arabia’s presence at GIF is spearheaded by Modon, the Saudi Industrial Property Authority, responsible for developing and supervising industrial lands in Saudi Arabia and tasked with regulating and promoting industrial estates and technology zones. In addition, leading companies from the kingdom include Ashcroft-Dresser, Saudi Bitumen, Pan Gulf, and AFI (Alaa for Industries). Meanwhile, the Dutch Pavilion will make a welcome return this year following a colourful and successful debut in 2013 which featured 16 companies. In keeping with HCE’s commitment to continuous improvement and innovation, exhibitor-visitor engagement will be enriched by a presentation zone – which debuted in 2012. The 2014 version will feature targeted presentations from leading industrial companies about services, products and procurement requirements. Jubran Abdulrahman, managing director of HCE, said: “As in previous years, a core objective of GIF 2014 is to be a ‘business-enabler’ in a region where billions of dollars are being spent on industrial and infrastructure capacity building. “Against this background, HCE is making every effort to yet again deliver a show where real business is done and high-calibre contacts are made in the Kingdom of Bahrain, a premier regional trade conduit. 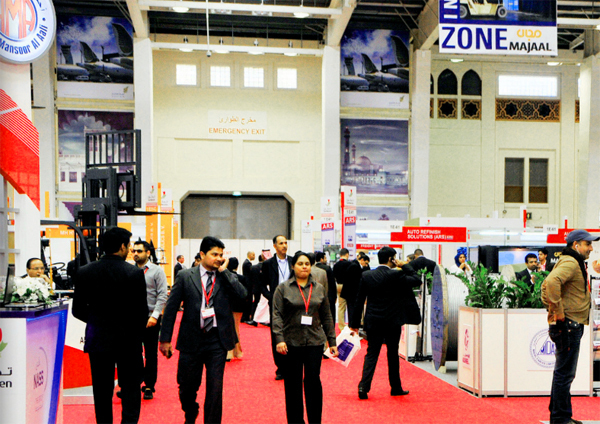 In addition to the strategic zone sponsors, Gulf Industry Fair 2014 also enjoys support from the British Offset Office, the Bahrain Chamber of Commerce, The Middle East Association, AHK (German Chambers Network), GAC and Machinery Trade International.